Navajo, Hopi, Zuni: Save the Confluence! The Navajo (Dineh) group “Save the Confluence” are opposed to the development of the Grand Canyon Escalade project at the confluence of the Colorado and Little Colorado Rivers on the Navajo Reservation in Arizona. This video explains why this area is sacred and should be preserved in its natural state. A new $120 million resort and tramway project is being pushed forward by the Navajo Nation government despite the obvious risks to the environment not to mention the cultural and spiritual well-being of the Dineh, Hopi and Zuni Peoples. The troubling “Grand Canyon Escalade” project would be situated at the confluence of the Colorado and Little Colorado rivers, which is considered sacred by the Dineh, Hopi, Zuni and others. Several groups have come together to stop the project, including the Diné Medicine Man Association, Inc., Forgotten People, Next Indigenous Generation, and the Grand Canyon Trust. Many local Dineh are also speaking out against the project, which was tabled by Navajo Nation President Ben Shelly without their knowledge or approval. According to the website of Save The Confluence, President Shelly shut the stakeholders out of local economic development plans after U.S. President Barack Obama lifted The Bennett Freeze. And then, President Shelly signed an agreement with a developer behind closed doors. Hopi leaders have stepped forward as well. In October, they unanimously agreed to oppose the commercial initiative. On top of these clear-cut threats–not to mention the back-room dealing–there are environmental concerns with the Grand Canyon Escalade. The Grand Canyon Trust observes, “There are… issues such as potential adverse effects to Blue Spring from pumping groundwater and disposing sewage. 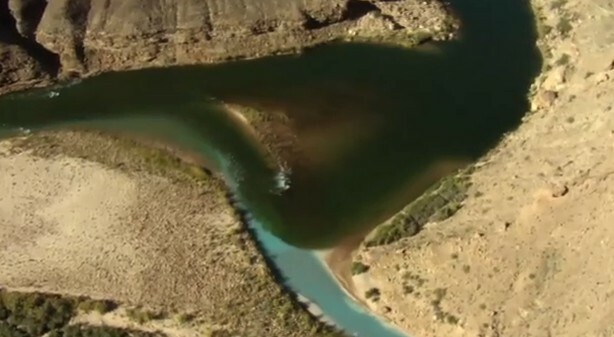 This spring is the perennial source of water for the Little Colorado River and the only remaining breeding habitat for the Grand Canyon’s endangered humpback chub. Significantly, the project would result in development below the rim, bringing noise and light pollution to the most isolated and pristine part of the Grand Canyon.